Here's another opportunist obscurity from Marvel UK, a sword'n'sorcery one-shot from the summer of 1981. 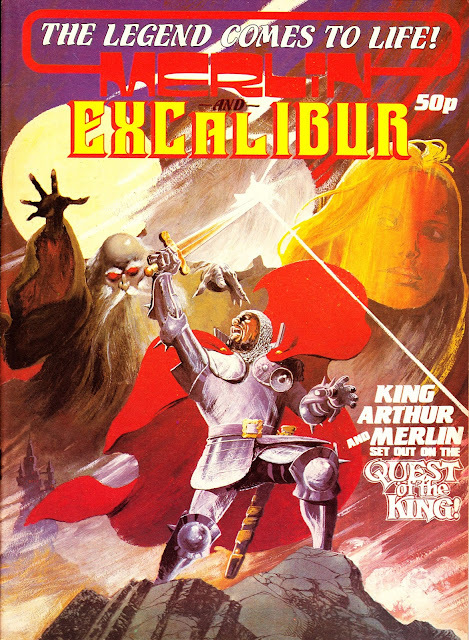 Although unrelated to the movie, it can be no accident that Marvel tried to make hay whilst the sun shone by releasing this around the same time that John Boorman's retelling of the King Arthur legend was also doing the rounds. The contents (by Moench and Buscema) originally appeared - behind a different cover - a year-or-so earlier in the American MARVEL PREVIEW issue 22. M-UK also published an official poster magazine - as a STARBURST spin-off - to the film.